Food Trucks is all the rage and you can find some great eats in neighborhoods all around the Seattle area. Our innkeepers are always in search of the best and we want to share what they found. The innkeepers from Sleeping Bulldog Bed & Breakfast checked out Nosh where they had the BEST FISH & CHIPS they have ever eaten. Moist perfectly cooked fish with a crunchy coating. 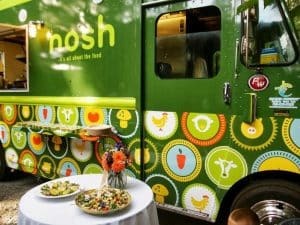 Nosh travels around the city but they caught up with them in the Fremont neighborhood. The innkeepers at The Guest House Bed & Breakfast have enjoyed the Southwest Fusion Smoked Meatloaf Sandwich on a Macrina Brioche Bun at Nibbles in the south Seattle neighborhood of Burien. 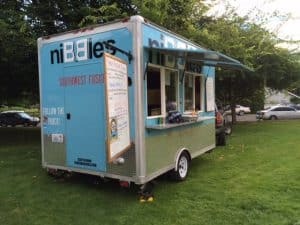 Nibbles also travels around but The Guest House innkeepers found them at The Burien Farmers Market on Thusdays and also Thursday evenings at Burien’s Music in the Park. 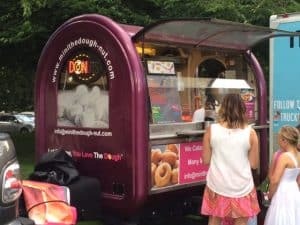 Another delectable treat the innkeepers at The Guest House found at Burien’s Music in the Park is scrumptious mini doughnuts from the Mini The Dough-Nut Trailer. Oh freshly made, warm and melt in your mouth with a great selection of toppings to choose from. Mini doughnut makes the perfect dessert.